Within the community of believers, theology is not only something Catholics receive instruction in, it is something they do. 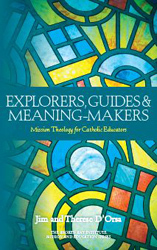 In this first volume of the Mission and Education series, Australian Catholic educators Jim and Therese D’Orsa invite and assist colleagues to become ‘grassroots’ theologians themselves. It is an invitation to deeply integrate their human experience in the service of today’s young people with the Catholic community’s living faith tradition. Catholic schools connect with families and the wider Church. They also interface with society and culture. Their potential for evangelising mission is, therefore, extraordinary. In both scholarly and practical ways Therese and Jim D’Orsa invite educators to explore this potential, and they provide much assistance for doing so. I warmly commend this work to all educators seeking to engage in-depth with the Church’s mission through Catholic Education. James and Therese D’Orsa’s book on mission theology is a significant contribution to a field invariably characterised as being either highly ethereal or overly practical. Either way, mission theology has a history of being marginalised among theologies because its relevance is understated or it is regarded as insufficiently scholarly. The great contribution of this book is in correcting these misperceptions. In one hit, they demonstrate that mission theology is well founded on religious scholarship and stands tall in the field while, at the same time, illustrating its practicality for workers in a variety of religious contexts. The authors deserve to be commended for such an outstanding contribution.